Staley Da Bear, October 28, 2008. Staley Da Bear is the official mascot of the Chicago Bears of the National Football League. He is an anthropomorphic bear with a customized team jersey. Staley's name is eponymous to A. E. Staley, who founded the Bears’ franchise in 1919. He debuted during the 2003 Chicago Bears season to entertain fans at Soldier Field. He has since participated in many charity events, parties, Chicago Rush games, and other Bears-related events. Staley has also made numerous cameos on television, especially during the team's Super Bowl run in 2006. Through 2007, Staley's winning percentage with the Bears is .537. 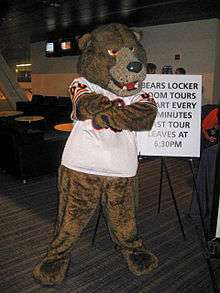 Staley was named a three-time Pro Bowl mascot in 2004, 2006 and 2007. At halftime, Staley and his "furballs" (NFL mascots and various other mascots) would take on a group of youth players from Naperville. Staley also frequently attends annual holiday parties hosted by the Bears. Staley has also appeared in the Elmhurst St. Patrick's Day Parade. Staley and other NFL mascots have also participated in Halloween events. Staley also visits area schools to promote and participate in anti-bullying assemblies and programs. ↑ "Staley Da Bear's Bio". Chicago Bears. Retrieved 2012-03-15. 1 2 "Staley somehow makes Pro Bowl". Chicago Bears. 2009-02-11. Archived from the original on 2010-04-23. Retrieved 2012-03-15. ↑ "Furballs foiled again". Chicagobears.com. 2009-12-30. Archived from the original on 2010-06-18. Retrieved 2012-03-15. ↑ "Staley crashes Bears holiday party". Chicago Bears. 2008-12-29. Archived from the original on 2010-04-23. Retrieved 2012-03-15. ↑ "Halloween is fun for Bears too". Chicagobears.com. 2009-11-06. Archived from the original on 2010-04-22. Retrieved 2012-03-15. ↑ DePaolis, John (2011-11-25). "Taft School invites Bears mascot for anti-bullying assembly". The Lockport Legend. Retrieved 2013-03-28.